• RepeatEvery.bat is a new batch file which repeats a command forever, with a specified interval, until any key is pressed. The second public beta version of WMIGen.exe (compiled executable) has been released. The time-limit has been changed from a week to a month, i.e. this one won't expire before July 20, by which time a new beta (or maybe even final) release will be available. Windows 10's Windows Defender seems to mark the first beta as malware. Because I expect to release several more beta releases, with relatively short intervals in between, I will not submit the beta releases to Microsoft's false positives list. Today the first public beta version of the completely rewritten WMIGen (compiled executable version, written in C#, instead of HTA) has been released. I regularly used the HTA myself, and I got fed up with its poor performance, especially on older hardware (i.e. my ASUS EEE-PC NetBook); add to that Visual Studio's excellent IDE which makes writing and debugging code so much easier, and you may understand why I opted for a compiled executable. • Error handling in the updated CloneDate.exe, LoCase.exe and UpCase.exe has been improved: instead of aborting on the first file error, they will now catch and report any file error and then continue with the next file. • Today I received messages telling me that a modified version of my VBScript download script is being abused by criminals to download and run malware on unsuspecting recipients' computers. The information on my site is available for everyone, unfortunately I have no way to block bad guys from abusing it. The most important one: use common sense; why would anyone you don't know send you e-mails with ZIPped attachments? 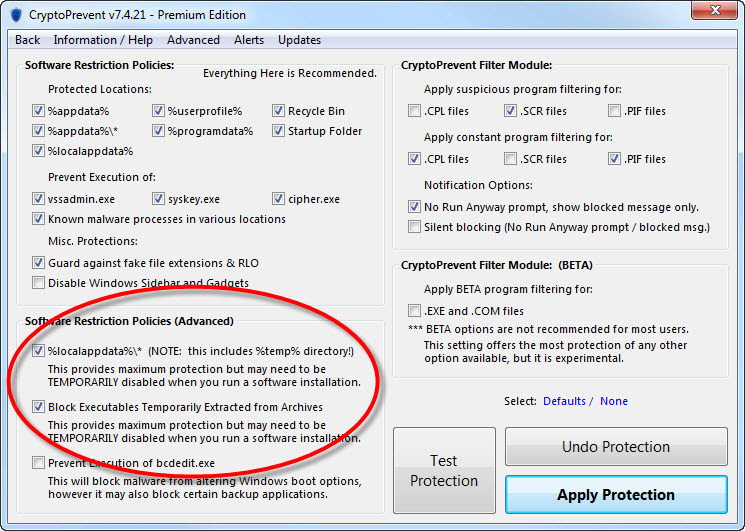 Consider using filter rules to block e-mails with ZIPped attachements. I know Mozilla Thunderbird has excellent filtering features; check your own e-mail software's manual, or built-in or online help, to find out if it supports filtering. Use up-to-date anti-malware software, keep Windows up-to-date with Windows Update, and keep your browser(s) and its add-ons up-to-date. This type of malware often drops its executable in the %Temp% directory, so why not block all executables in the %Temp% directory? Make explorer show extensions for all file types, allowing you to see what type of file is sent. 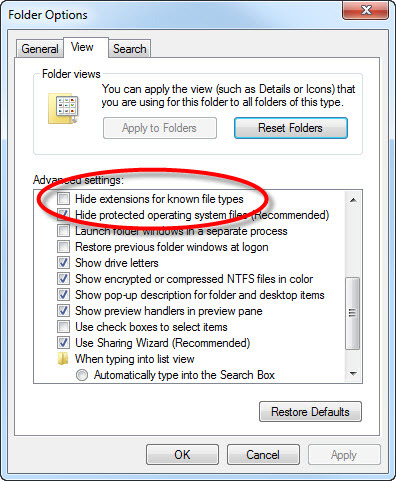 For Windows 7: open "Folder Options" in the "Configuration Panel" and uncheck "Hide extensions for known file types". This is, of course, of no use if you don't have a clue about file types and their extensions, but in that case I doubt you would be visiting this site. Consider if associating VBScript files with Notepad instead of WScript will be too much of a nuisance for you. If you do associate ".vbs" with Notepad, you will have to use the command line or shortcuts to run them. FOR /F "tokens=1* delims==" %A IN ('ASSOC .vbs') DO FTYPE %B=Notepad "%1"
Rerun the first command to check the changes. If "1" is shown instead of "%1", rerun the second command using "%%1" instead of "%1". Next time you doubleclick a VBScript file in explorer it will open in Notepad. Note that this will only prevent VBScript files from running when doubleclicked, they can still be run using the WSCRIPT or CSCRIPT commands! • Who would have guessed that a new book on batch files would see the light in 2016? Well, Elias Bachaalany recently did write a new book on the subject: Batchography - The Art of Batch Files Programming (and its Kindle edition). • Very interesting development: run Bash on Ubuntu on Windows 10. • I don't use Skype very often, so it really annoyed me when Skype, after every update, reenabled its autostart feature. That is why I wrote NoStartSkype.bat, a batch file that creates a scheduled task to remove Skype's autostart from the registry at each logon and at each screen lock (a work-around for the limitation that I could not create a scheduled task that would do this at logoff). Run the batch file once, with elevated privileges, and do not delete (nor move) the .reg file it creates, which is used by the scheduled task.